As the cryptocurrency market expands, so too does the volume of energy required to maintain it. If the Bitcoin market alone continues to progress at its current rate, it will soon consume more energy annually than countries such as Peru. One potential solution to this issue is renewable energy; and that is where 4NEW hopes to come into play. 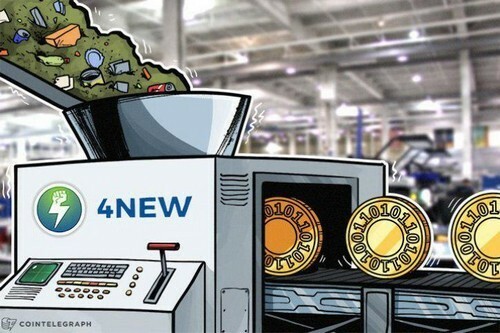 Describing themselves as ‘world’s first eco-friendly, tangible, waste to energy Blockchain solution,’ 4NEW’s premise is to take waste products and transform them into a usable energy source. This technology has been in adoption for over 70 years with approximately 83 independent waste to energy plants already in use within the US and many more in other countries. This energy can be sold to the national grid, or used to power 4NEW’s own mining farm. Their white paper explains that it will be cost-effective. Integral to this system is the unique 4NEW crypto token, KWATT (currently ERC20, Ethereum based contract). Each of these embodies 1kW of electricity annually (the global average retail price per kW of electricity is currently $0.15). The ICO opened at the end of January and will continue until March 2018. Following this, 4NEW plan to open two new renewable-powered mining sites in the UK. These will initially produce 10 megawatts of electricity an hour, progressing to 40 megawatts an hour once the systems are fully up and running at maximum capacity. The estimated maximum capacity annually is 346 mln kW, scaled down to 300 mln kW to account for factors such as repairs and routine maintenance. Crucially, as 4NEW will produce their own energy, they can apply their own fixed price to sales, leading to a standardization of fees. This sets it apart from other Blockchains which have to purchase their energy externally. This Blockchain enables KWATT coin holders to either sell the energy within their coins to the national grid or utilize them on 4NEW’s mining farms. 4NEW proudly state that their team holds over 300 years combined experience in crypto and Blockchain. CEO Sandeep Golechha says he hopes their methods of energy utilization will become industry standard, should their power plant, Blockchain and mining plant be fully operational by Q3 2018 as intended. The huge energy costs associated with Bitcoin transaction and mining are growing and will continue to do so. 4NEW states on their website that in just over 14 months, worldwide energy usage associated with Bitcoin transactions grew from the equivalent of 7.5 US households each day to that of 17.5 households. Iceland already uses more energy on crypto mining than on powering households. Other studies reveal its estimated usage of 42TWh of electricity a year exceeds countries such as New Zealand and Hungary (and 157 other countries) and consuming as much CO2 as one mln transatlantic flights. These daunting statistics highlight the urgent need for crypto to turn to renewable energy as a source– which 4NEW is helping to facilitate. Should the scheme continue to prove successful, the world could observe a substantial drop in energy costs associated with crypto, especially from mining farms using extremely polluting sources such as coal.